See Pyrus communis L. var. ‘Passe Colmar’ for a description and details. ‘Colmar Preul’ is a synonym of this pear. ‘Passe Colmar’ is figured in Album de Pomologie in a plate with ‘Beurré de Rance’ [ADP vol.2, pl.41/1849], the illustration used here. Listed only in the 1857 catalogue in an Addendum as ‘Colmar Prule’ [Pear no.53/1850]. Listed in the diary but with no comment. [Diary B, MP A2951/1862]. Obtained from Veitch’s Nursery, probably the original Exeter premises. 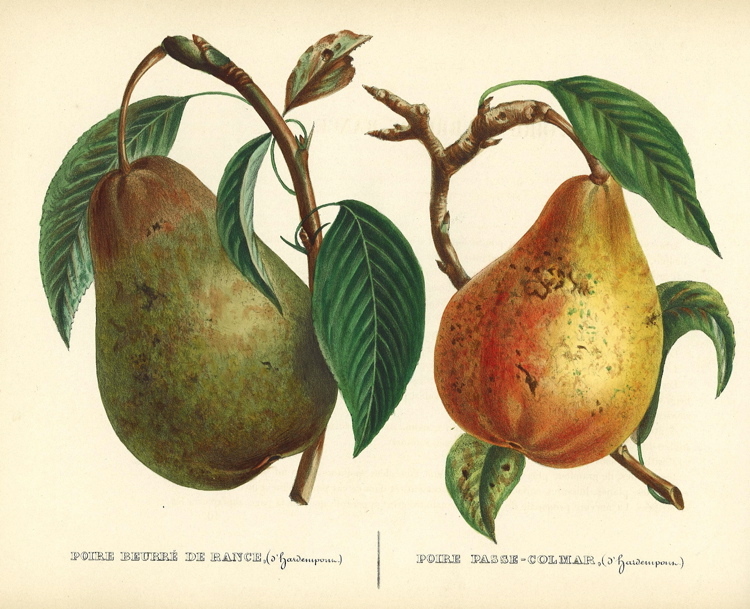 Pear ‘Passe Colmar’ | ADP vol.2, pl.41/1849 | Pomologische Bibliothek. Passe Colmar is the yellow pear on the right.